After the outbreak of the Civil War in April 1861, Confederate States of America (C.S.A.) President Jefferson Davis assigned Albert Pike to negotiate treaties with the Five Civilized Tribes of Indian Territory, who had been removed from the South in the 1830s. Many of the tribesmen were slaveholders with divided loyalties. From the Southern point of view Indian Territory was a buffer between Union Kansas and Confederate Texas and a potential source for livestock and grain. In May 1861 the District of Indian Territory, C.S.A., was created. In January 1862 it joined Arkansas and Missouri to form the Trans-Mississippi Department. Throughout the war Indian Territory passed from one district or departmental jurisdiction to another until it became a separate district of the Trans-Mississippi Department in July 1864, with Brig. Gen. Douglas H. Cooper commanding. By November 1861, Pike had concluded treaties stipulating that the tribes could retain their lands, property, and annuities and would receive supplies and weaponry. Regiments from Texas were sent to defend Indian Territory, whose various commanders included Pike and Maj. Gen. Earl Van Dorn. The Indians fought as separate units under their own leaders. Notable among them was Stand Watie. The Confederacy controlled less than half of Indian Territory following the battle of Honey Springs in July 1863. The beleaguered South was unable to send supplies and arms. Tribal warfare destroyed property and left thousands homeless. The Five Civilized Tribes were forced to renegotiate treaties with the United States after the Confederacy's defeat in April 1865. Cottrell describes in detail the guerrilla warfare, the surprise attacks, the all-out battles that spilled blood on the now peaceful state of Oklahoma. In addition, he introduces the reader to the interesting and often colorful leaders of the military North and South, including the only American Indian to attain a general's rank in the war, Gen. Stand Watie (member of the Cherokee Nation). With outstanding illustrations by Andy Thomas, this story is a tribute to those who fought and a revealing portrait of the important role they played in this era of our country's history. Meet The Author: A resident of Carthage, Missouri, Steve Cottrell is a descendant of a Sixth Kansas Cavalry member who served in the Indian Territory during the Civil War. A graduate of Missouri Southern State College in Joplin, Cottrell has participated in several battle reenactments including the Academy Award winning motion picture, "Glory". Active in Civil War battlefield preservation and historical monument projects and contributor of a number of Civil War relics to regional museums, Cottrell recently co-authored Civil War in the Ozarks, also by Pelican. It is now in its second printing. Description: In this compelling portrait of interracial activism, Mark A. Lause documents the efforts of radical followers of John Brown to construct a triracial portion of the Federal Army of the Frontier. Mobilized and inspired by the idea of a Union that would benefit all, black, Indian, and white soldiers fought side by side, achieving remarkable successes in the field. Against a backdrop of idealism, racism, greed, and the agonies and deprivations of combat, Lause examines links between radicalism and reform, on the one hand, and racialized interactions among blacks, Indians, and whites, on the other. Lause examines how this multiracial vision of American society developed on the Western frontier. Focusing on the men and women who supported Brown in territorial Kansas, Lause examines the impact of abolitionist sentiment on relations with Indians and the crucial role of nonwhites in the conflict. Through this experience, Indians, blacks, and whites began to see their destinies as interdependent, and Lause discusses the radicalizing impact of this triracial Unionism upon the military course of the war in the upper Trans-Mississippi. 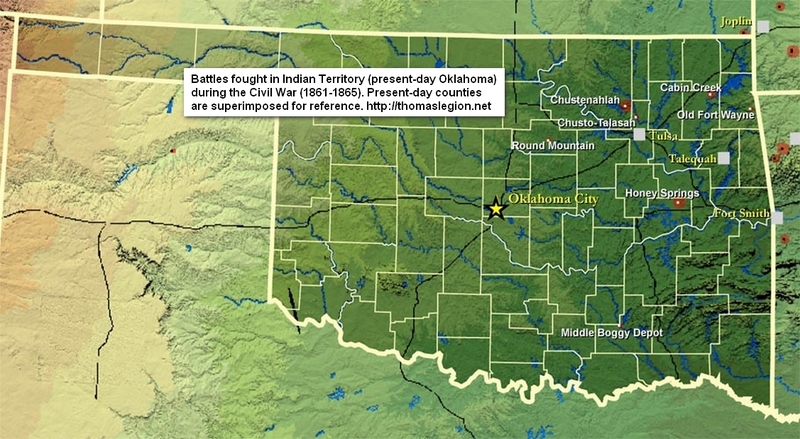 The aftermath of the Civil War destroyed much of the memory of the war in the West, particularly in the Indian Territory (now Oklahoma). The opportunity for an interracial society was quashed by the government's willingness to redefine the lucrative field of Indian exploitation for military and civilian officials and contractors. Assessing the social interrelations, ramifications, and military impact of nonwhites in the Union forces, Race and Radicalism in the Union Army explores the extent of interracial thought and activity among Americans in this period and greatly expands the historical narrative on the Civil War in the West. BIBLIOGRAPHY: LeRoy H. Fischer, ed., The Civil War Era in Indian Territory (Los Angeles: Lorrin L. Morrison, 1974). Fred Hood, "Twilight of the Confederacy in Indian Territory," The Chronicles of Oklahoma 41 (Winter 1963-64). Lary C. Rampp and Donald L. Rampp, The Civil War in the Indian Territory (Austin, Tex. : Presidial Press, 1975). George H. Shirk, "Indian Territory Command in the Civil War," The Chronicles of Oklahoma 45 (Winter 1967-68).